and trailers are not allowed. Limit 1 parking pass per suite; 2 passes per 2 and 3 bedroom units. 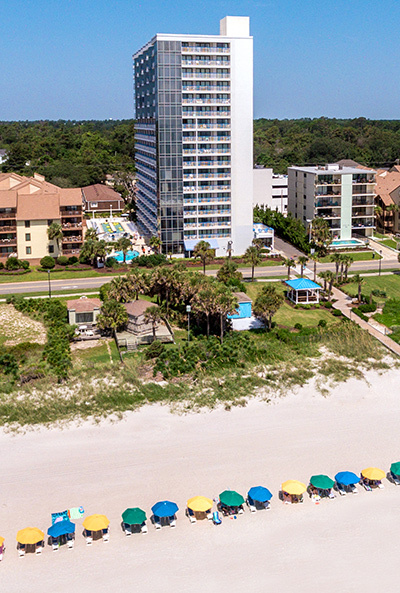 Forest Dunes Resort is located along the Golden Mile area of Myrtle Beach where guests can enjoy peace and quiet and the serene beach, just steps away. Forest Dunes is perfect for families, seniors, couples’ getaways, golf vacationers and others looking for a beach retreat. If you arrive with a $0 balance or pay any portion of your stay in cash you will be required to pay a $100 refundable security deposit. Security deposits will be returned at check-out. Any guests checking out overnight will have their deposits mailed back. Fees An additional $10 per person, per night may be added for adults ages 17 or older; kids 16 or younger stay free within maximum occupancy. ; state taxes; local taxes; and additional fees. Fines may be charged for anyone who smokes on the resort property. All fees are subject to change without warning. Alterations to reservations must be sanctioned by the manager two days in advance of arrival. Modification of reservation is not guaranteed and any changes will result in a changed rate. Your new balance will be refigured to the lowest existing price when the changes are made. The credit card used for the deposit must be presented at check-in, with matching photo ID. Only U.S. funds are accepted. The balance of the room charge is due upon arrival. No refunds for those leaving before set departure date. Cancellation Notice: Reservations must be cancelled prior to 7 days before arrival for a reservation refund. There is a fee for cancellation refunds. Cancellations made after this time frame will result in the forfeit of deposit.